I am very excited about starting this new blog! I create beautiful jewelry almost every day, and it will be exciting to share that process and the results in this blog! As a up and coming jewelry designer, I need as much free exposure as possible, and feedback too! This is one of my most recent designs, and I absolutely love it! 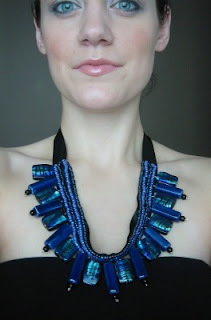 It's called "Indigo Peacock Plumage"
The great thing about this necklace is that it is so versatile and can be worn at a variety of lengths. 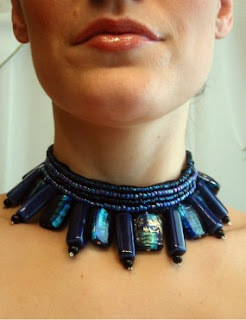 It looks absolutely stellar as a choker! See! Oh! In other news, everything in my shop is ON SALE 10% off with a FREE PRIORITY SHIPPING UPGRADE until January 1st, 2011!!! !